When summer rolls around, we spend less time on the Internet, more time with family enjoying the outdoors (I hope!) and our brains may slow down a bit too. But a healthy way to keep it sharp is a good book (or five). Traffic in your business may dip and things will slow down (if only for a short time) so why not take advantage and step away to clear your head, gain some new perspective and be refreshed? Learn from some of the pros on how to find purpose and meaning in your work. Sounds like a summer well-spent to me! Your family and your business will thank you soon enough after taking a look at even one of these fantastic reads. I challenge you to take action to better yourself and your business by ordering one of these books TODAY. Invest in your mind. Refresh your mindset. Learn new things. Change the world. 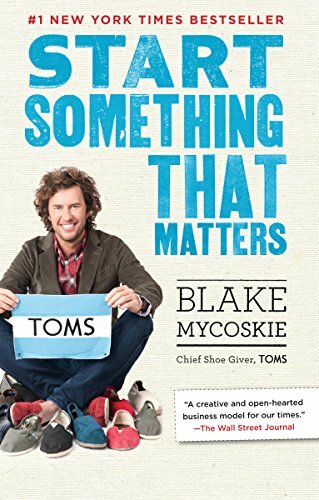 Bio: “Blake Mycoskie is the Founder and Chief Shoe Giver of TOMS, and the person behind the idea of One for One®, a business model that helps a person in need with every product purchased...Before TOMS, Blake, a native of Texas who always had an entrepreneurial spirit, started five businesses. His first was a successful campus laundry service, which he later sold. Between business ventures, Blake competed in the CBS primetime series, The Amazing Race. With his sister, Paige, Blake traveled the world and came within minutes of winning the $1 million dollar grand prize. Blake is an avid reader and traveler. He is passionate about inspiring young people to help make tomorrow better, encouraging them to include giving in everything they do. His hope is to see a future full of social-minded businesses and consumers.” Read more here. • You’re looking for a new model of success to share with your children, students, co-workers, and members of your community." Bio: "SCOTT HARRISON is the founder and CEO of charity: water, a non-profit that has mobilized over one million donors around the world to fund over 28,000 water projects in 26 countries that will serve more than 8.2 million people. Harrison has been recognized on Fortune's 40 under 40 list, Forbes’ Impact 30 list, and was ranked #10 in Fast Company's 100 Most Creative People in Business. He is currently a World Economic Forum Young Global Leader and lives in New York City with his wife and two children." 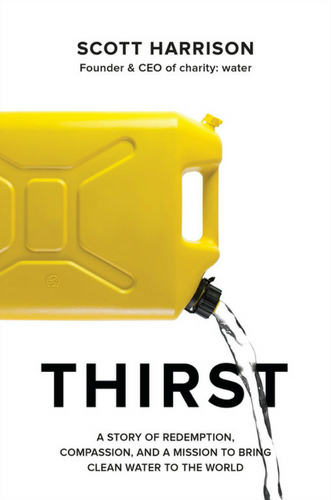 How the book gives back: 100% of author’s net proceeds will go to fund charity: water projects around the world. Where to buy it: Pre-order the book here! It’s available October 2, 2018. Bio: "Dr. Brené Brown is a research professor at the University of Houston where she holds the Huffington Foundation – Brené Brown Endowed Chair at The Graduate College of Social Work. She has spent the past two decades studying courage, vulnerability, shame, and empathy and is the author of four #1 New York Times bestsellers: The Gifts of Imperfection, Daring Greatly, Rising Strong, and Braving the Wilderness. Her new book, Dare to Lead: Bold Work. Tough Conversations. Whole Hearts., is scheduled for publication in October 2018. Brené lives in Houston, Texas with her husband, Steve, and their children, Ellen and Charlie." Book Synopsis: In The Gifts of Imperfection, Brené Brown, a leading expert on shame, authenticity, and belonging, shares ten guideposts on the power of Wholehearted living—a way of engaging with the world from a place of worthiness. How the book gives back: In this image and performance driven world we live in, it's easy to count ourselves unworthy and not good enough without much effort. But Dr. Brown has beautifully written this book to bring us to a place of finding our worthiness and living a wholehearted life. We are all imperfect and struggle to see ourselves in a positive light, but instilling the principle of worthiness where we tell ourselves "I am enough" can not only change our lives, but significantly impact the greater good of this world. Bio: “McKeown is the CEO of THIS Inc, a company whose mission is to assist people and companies to spend 80 percent of their time on the vital few rather than the trivial many. Clients include Adobe, Apple, Google, Facebook, Pixar, Salesforce.com, Symantec, Twitter, VMware and Yahoo!. His writing has appeared or been covered by Fast Company, Fortune, HuffPost, Politico, and Inc. Magazine. He is among the most popular bloggers for the Harvard Business Review and LinkedIn’s Influencers group: averaging a million views a month. Bio: "Jessica is an entrepreneur, investor, and speaker. Her work over the last decade has focused on financial inclusion, the sharing economy, and social justice. Jessica teaches Social Entrepreneurship at the Marshall School of Business at USC. She is a Venture Partner with SparkLabs Global Ventures, as well as an investor and advisor with the Collaborative Fund. She also recently served as Walt Disney Imagineering's first Entrepreneur in Residence, focusing on projects related to corporate citizenship, the sharing economy, and happiness. She continues to provide expertise in these areas as an independent consultant on social impact initiatives and more." In Clay Water Brick, Jackley challenges readers to embrace entrepreneurship as a powerful force for change in the world. She shares her own story of founding Kiva with little more than a laptop and a dream, and the stories and the lessons she has learned from those across the globe who are doing the most with the least." How the book gives back: This book tells the stories (and Jessica's own) of people who were the poorest of poor and had literally nothing, but decided to do something about it. Their stories teach us about "resiliency, creativity, perseverance, and, above all, entrepreneurship." If you are an entrepreneur or dream of becoming one, this book will help you find fulfillment in striving to make the world a better place through your entrepreneurial journey. Starting your business could change the world, so use the talents that you have, give graciously to the world and see what happens!